You can be/feel sure of something: you’re certain, you know for sure. they didn’t address one of the meanings of sure that English language learners rarely learn, and one of the more common sources of confusion between native and non-native speakers. “I’m sure” only means “I’m certain” when you say it with conviction. “Sure” by itself doesn’t mean yes. 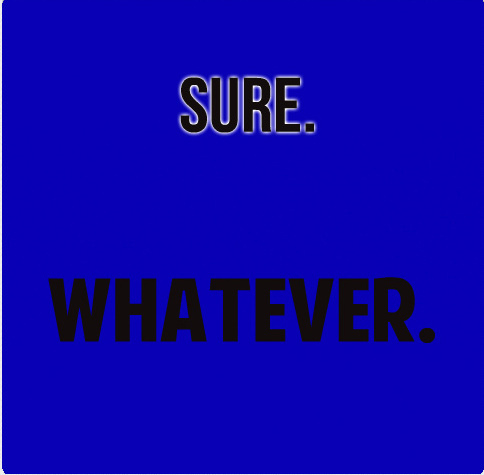 When someone asks you a question and you answer “sure” without any inflection, you are actually saying “Whatever– I don’t know and I don’t care.” “Sure” is also frequently used sarcastically. -Do you want to go to the Art Fair in Amsterdam? -Well, you don’t have to go if you’re not interested. -I won the race last Sunday. Urban dictionary defines sure as “the quickest way to answer a question when not paying attention that usually doesn’t include any thinking whatsoever,” “to show sarcasm, lack of interest,” among others. As you can see, “sure” can mean much more than just certainty, and if you use it with the wrong tone of voice, you might be implying something you don’t necessarily mean.